We offer 30-day money back and 12-month worry-free warranty with our friendly customer service. If for any reason you're not completely satisfied ,simply contact, we'll come back to you within 24 hours. iPhoneX,iPhone8,iPhone 7 plus,iPhone 7,iPhone6,iPhone6s,iPhone5,iPhone5s,iPhone SE,iPhone4,iPhone4s,iPod touch,Motorala,Samsung Galaxy S9 Note 8 S8 S7,LG G7 ThinQ,Huawei P20 Pro Mate 10,Sony Xperia XZ2 ,HTC U12+,ect. 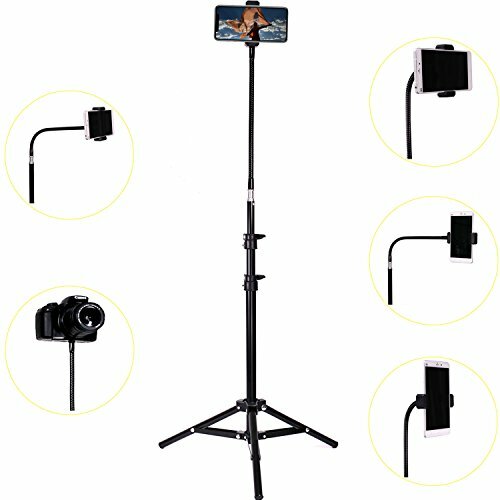 Tall & PREMIUM,Made of Premium Aluminum Alloy Construction,Height adjustable 2.5 ft to 7.2 ft with 0.98ft/30cm flexible gooseneck. UNIVERSAL CELL PHONE HOLDER the width of this cell phone holder is 2.28 inch minimum to 3.15 inch maximum, will compatible with most of smart phones, like iphoneX,8, 7 plus, 7, 6, 6s, 5, 5s, 4, 4s/iPod touch/Motorala/Samsung/LG/Huawei/HTC,ect. FLEXIBLE & ADJUSTABLE HOLDER 360 degree rotating phone holder, free to adjust any angle as you like for convenient reviewing, taking pictures or shooting videos. Solid Safety 3 Legs Stages,Aluminum alloy construction Supporting Stands, corrosion resistance, will not rust. Very light, after folded volume is very small,Easy to carry. 1/4 inch threaded screw tip on the stem also ok for Canon and Nikon,Three non-slip legs base equipped with antiskid device. If you have any questions about this product by Haitent, contact us by completing and submitting the form below. If you are looking for a specif part number, please include it with your message.